Wow....but couldn't resist because I got *the* call and just got back from the framers. And of course I can't wait to show off my beautiful framed finishes! 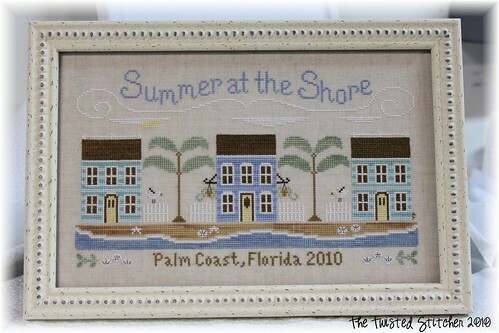 be more pleased, both are framed perfectly and framed using masterpiece glass, so the stitches are not distorted and UV protected. They both are lovely! Now.....where's my hammer? 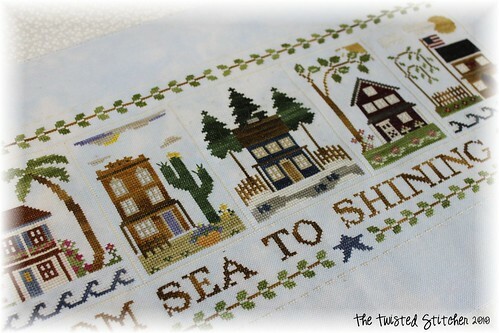 I'll be stitching by putting "my hands to work and heart to God"! Swinging in to show a small finish....this one was my current "car project" and I finished the stitching part last Wednesday, finished the beading Friday evening and finished the finishing last night. 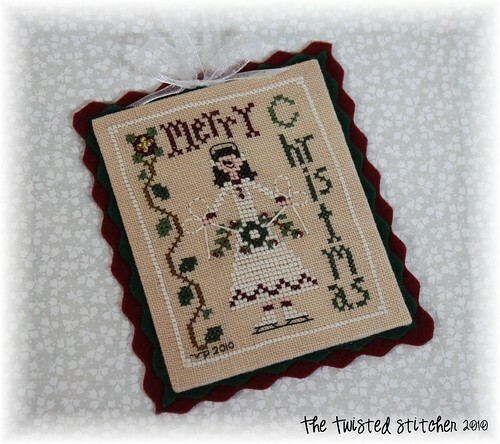 She's a cutie, that is for sure and I can mark another off my list of my LHN Monthly Ornaments! Now I just have one more to get done before the Peppermint Twist one lands in my mailbox. I'm proud of myself for halfway keeping up! And boy won't my tree look "all dolled up" come December....yes'siree it surely will! Diane has announced that the ornament series will continue for 2011, so that's 12 more ornaments!!! Boy oh boy....if I would keep up with LHN's monthly ornaments and then stitch some of the Prairie Schooler Santa's that I really want to do....my tree would be gorgeous! 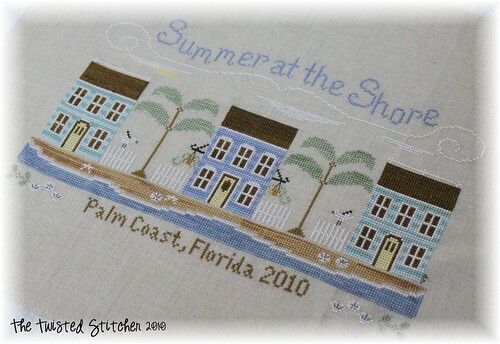 I need to make goals, or hire help :) and....don't forget I have two blogs worth of LHN Monthly Ornament stitchers doing a stitch-a-long...so if you'd like to join us, click on the links in my sidebar to take you to the blog and follow the directions there to be join us! Hello my dear friends and darling readers! 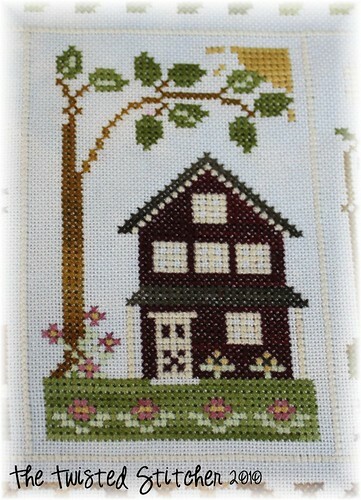 I've been stitching my little fingers to the bone to get this all finished up! "Day and night, day and night stitching, stitching by my candlelight." 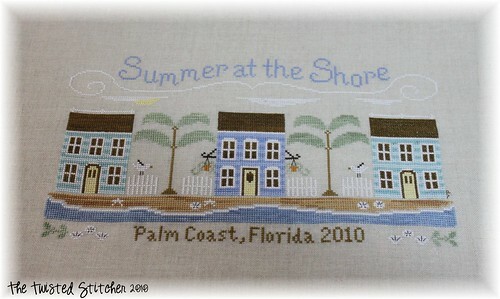 I fell in love with this design the moment my eyes lit upon it because it really and truly looks like the place we stayed at while on vacation this summer. And, I knew the change I would make in the the design to make it my own. 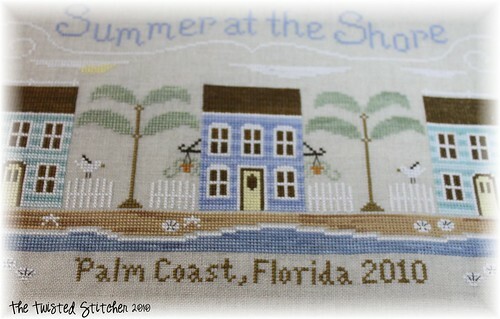 did you see that I replaced "Seashells and Sunshine" with "Palm Coast, Florida 2010"? Of course you did...its not hard to miss. But this makes it mine and mine alone and it will always represent the truly awesome vacation that me and mine shared on the beaches of Palm Coast, Florida. It holds such a dear place in my heart! 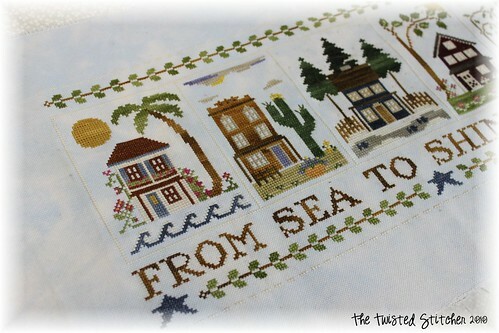 And that's what I thought of the entire time I was stitching this piece - our time spent together as a family on vacation this summer. It shall hold a favored spot on our home walls too. taking a design and incorporating something meaningful to you makes it that much dearer to your heart? 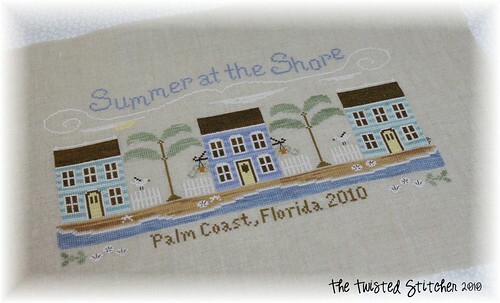 I do, and I'm sure you've noticed that I incorporate some piece of me into many things I stitch. 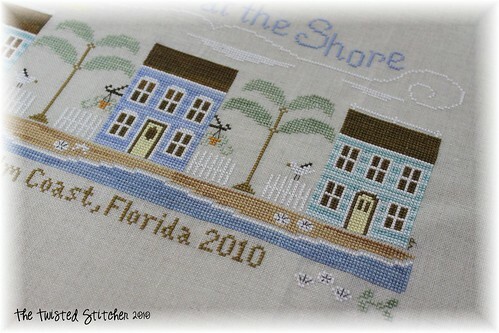 I like to make my stitching personal, what about you? There they all are....is your name in the bowl of DESTINY? 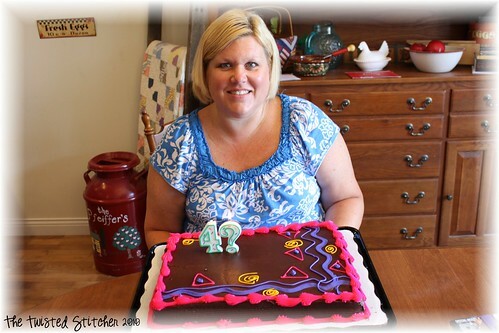 "Happy Birthday Vonna!!! Such a beautiful piece and finishing! I think my favorite thing about you is your positive attitude and your faith. 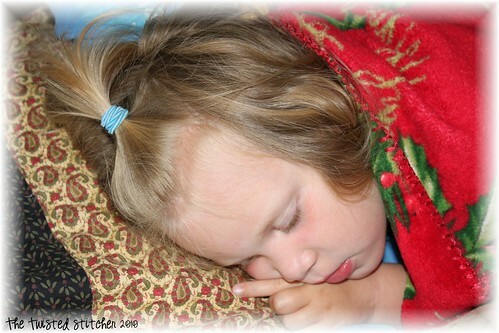 I read your blog to be encouraged and I always leave with a smile. 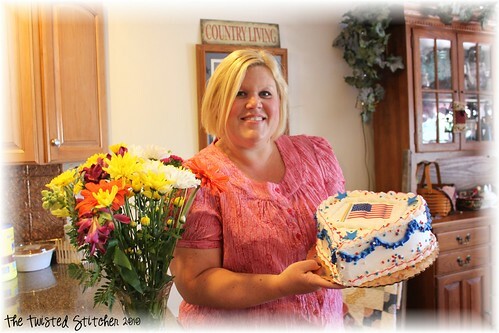 Happy 4th of July, girlie!! Sharon Crescent"
a BIG "thank you" for all your birthday wishes to me :) Wow! astounding...thank you :) Each one sent by comment, by e-mail or by facebook has really made me smile. I'm flabbergasted at the kindness each one of you have shown to me. I'm am humbled. Thank you! GORGEOUS?! I cried when I opened it up because I have this pattern and I have these tins saved back to make for my girls and I've never gotten around to making them, let alone having one for myself. 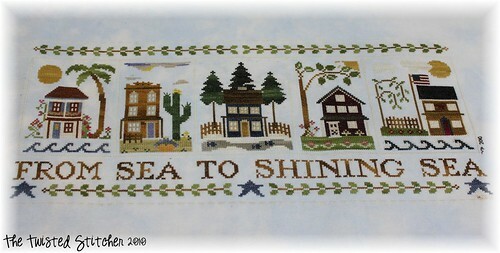 So THANK YOU Marie for taking all the time you did for stitching, finishing and making this set especially for me. THANK YOU! 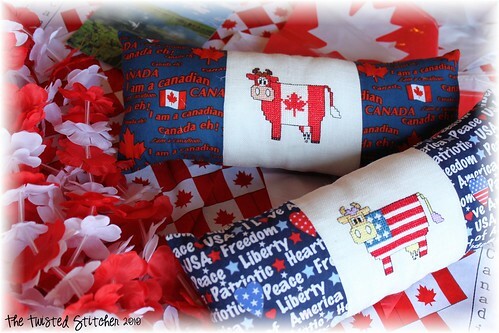 And thanks for those sweet stacked patriotic pillows and all of the COOL extras :) Hugs my friend....you are a star! Everytime my eyes alight on this beauty, I smile thinking about my friend Marie (who is a friend to all)! 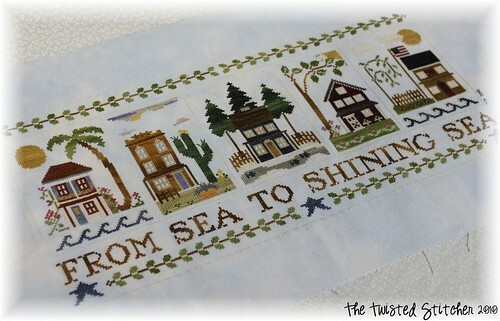 so sweetly knitted patriotic kitchen cotton dish rags from dear Pam (a.k.a. 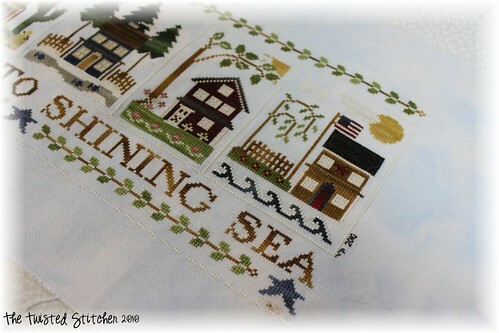 pjstitcher). Pam doesn't have a blog, but she's a faithful follower of many blogs. She's a real sweetie too and I have enjoyed a friendship with her by e-mail for the last several months. Thank you Pam for your sweet generosity and for remembering my birthday! You are a dear, dear lady and friend :) THANK YOU! 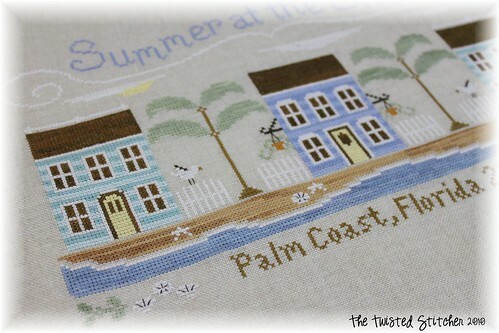 I was still sitting in my nightgown at 10 a.m. stitching away because I didn't have to work, my kids were occupied by the television and I thought what the "hay" its a holiday! Then the doorbell rang. I thought it was most likely the neighbor kids since none of our families live close and I wasn't expecting any friends to drop by...so I told my kids to go get the door bell. Well they walked to the door, opened it and said, "What are you doing here?!" Then I heard my 5 year old nephew shout, "HAPPY BIRTHDAY AUNT VONNIE!" My Mom, brother, sister-in-law, nephews and a dear family friend, drove 2 hours up to surprise me for my birthday. They brought me flowers and a cake and took me out to eat for lunch. We visited a few hours in the afternoon and then they drove back home. I sure was surprised and so happy that they came to see us! Thank you to my family who drove over 4 hours on Saturday to surprise me! :) That was so much fun! my Godson and newest nephew Benjamin! See he already only has eyes for Aunt Vonnie ;o) He thinks Aunt Vonnie rocks! was spent cleaning our basement as we had gotten to an "intervention hoarding" level. So we made Keep Piles and Donate Piles all afternoon. We loaded up the van and Keith took the donates to Goodwill....where the man in the donations place said to him, "You're donating all this?" Yep, it was that bad.... But NOW I have a clean basement. 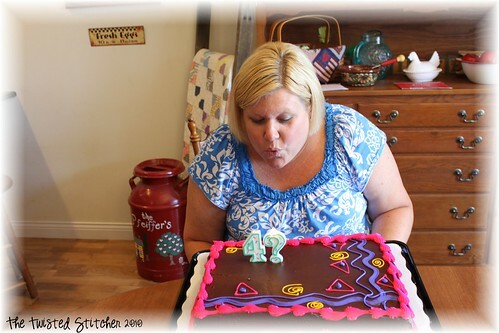 So Keith (who just turned 40 on May 14th) and I can start our 40's out with a clean slate! my many thanks for your visits and comments, your well wishes and words of wisdom, and everything you share with me! May I also wish a happy 4th of July to my United States of America brethren! I hope there is a doodle in your Yankee as you celebrate our country's birthday! is perfect for my birthday giveaway because it sums up everything about me. 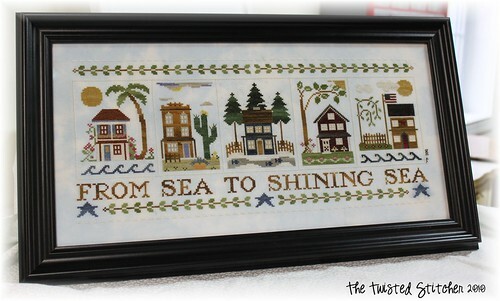 I love Little House Needleworks, I love my home, my birthday is in the summer and I love my country. Perfect, yes? Please do not advertise this giveaway, I am not interested in gaining more followers, rather my intent is to celebrate my 40th birthday with my faithful followers, readers and friends of this blog. the lucky winner will be announced that day. when I get to (at last) show you all some lovely, gorgeous presents that I received from some dear friends. I've been waiting to show them on my actual birthday! I want to express my most sincere,heartfelt thank you to YOU my readers and my followers. Each comment that you leave, each e-mail that you send, each friendship I have gained has touched my life irrevocably. Thank you for making an old woman smile! I'll be keeping my "hands to work and heart to God". ease of travel. I only had six little packs to take that already contained all the threads and the patterns ~ all I had to provide was the fabric, needle and will power to stitch it. EASY! I put everything inside the same little bag that each individual pattern came in and I was good to go. So when you are travelling this summer...give the idea a whirl. The collaboration thread packs are perfect travelling companions. that's a wrap! Now its off to herd my kiddos into bathing suits, pack a cooler and slather on some sunscreen because we're off to the pool, baby! It's FRIDAY! Yeah! This great land of ours is varied and wonderful. A site to behold, but just for the record books - I'm proud of my little piece of the pie and my Mid-Western roots. There is no place like home! 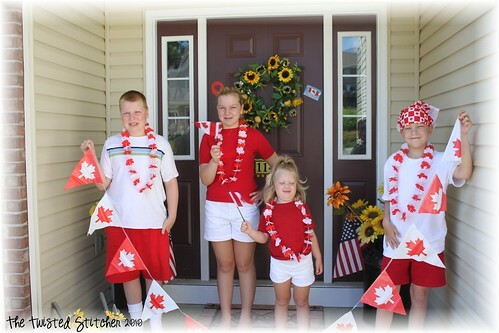 to my good buddy and dear stitching friend Kathy A who sent me a big 'ol goodie bag full of Canadian Treats, my kiddos and I are happily celebrating Canada Day! 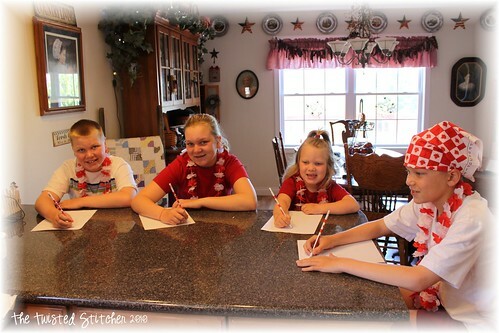 learning about Canada and its history, here my little pupils sit taking notes using their Canada pencils that Kathy included in our goodie package along with other festive goodies that we are wearing today to enhance our Canadian spirit! we happily took our festivities outside and waved at all passers by while we gustily sang, "O Canada..." We got a few odd looks, but heck we didn't care....we filled our lungs with fresh Indiana air and sung our hearts out! we came inside and had some lunch because singing and showing our Canadian spirit made us hungry! What did we have for lunch you ask? Why, Canadian Bacon Sandwiches with lettuce and tomato on a lovely crusty bread! while I was photographing the sweet pillows that Kathy A. stitched and made for us, my kids and I were practicing our Canadian accents. We thought we got pretty good, eh?